My paternal side of the family lived in Seattle and Washington. I lived in Texas. But I grew up as a young lad, teenager, young adult visiting Seattle and my favorite Aunt. She was Aunt LaVaughn by name but she was truly the most wonderful larger than life character. She was my very own Auntie Mame. Every visit, we would go up to the rotating restaurant at the top of Seattle Space Needle. It was magical. In my adult life I been to Seattle many times. It feels like a second home considering I've been there so many times and had so many important people there throughout my life. The last time I was there was five years ago. We went to the restaurant for lunch. It was lovely. (Except as the room revolved pieces of gum left by children over the years would reveal themselves.) It was disgusting. But they served as much as a landmark as the beautiful 360 degree Seattle cityscape that was hundreds of feet below. It was a very memorable dining experience then, when I was 50 as it had been decades when I was there as a young boy. The last time I was there the renovation were announced. Architectural Digest reports that the project is completed (1). It looks as though they truly have made it a more modern and enticing experience. 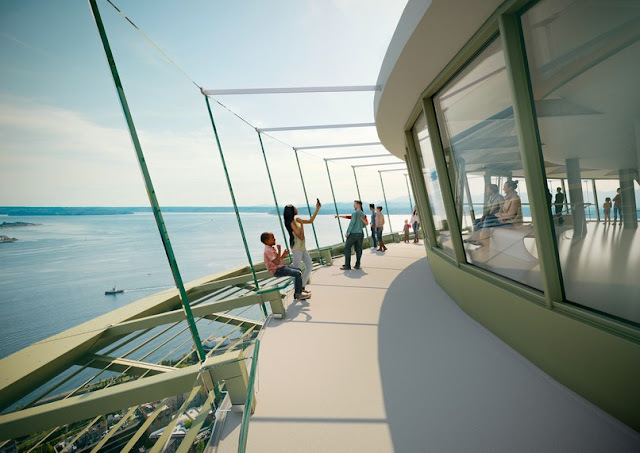 (1) Kristine Hansen, Architectural Digest, May 2018, "Seattle’s Iconic Space Needle Prepares to Unveil a $100 Million Renovation"